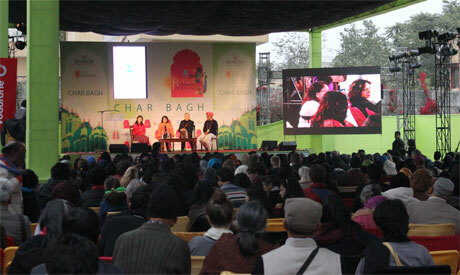 Taking place across three cities, the seventh India by the Nile festival (5-17 March) took Egypt by storm. Over seven years the annual event — launched in 2013 — has become known to a large segment of the Egyptian population. A one of a kind, multidisciplinary showcase for India’s classical and contemporary culture — dance, music, theatre, film, literary encounters, creative workshops, cuisine, yoga and wellbeing, crafts, merchandise, as well as discussions of its connections with Egypt — it has given the Egyptian audience the opportunity to come in contact with such Indian stars as Amitabh Bachchan, Javed Akhtar and Shabana Azmi as well as acclaimed artists like Grammy winner Vikku Vinayakram, renowned violinist L. Subramaniam, Indian Ocean, Dona Ganguly, Sonam Kalra, Shubha Mudgal and many others. India by the Nile is the result of hard work by many parties, from Teamwork Arts (a company that specialises in presenting Indian art through festivals all over the world) to the Indian Embassy in Cairo and many Egyptian partners. For years I’ve written on this culturally fascinating event, full of colour and value, speaking to many participating artists as well as the Teamwork Arts Director Sanjoy Roy. But among the sprawling creative medley one woman stands out. She can be seen in the corridors of the theatres, to one side of the open-air performance spaces, and in meetings with Indian and Egyptian officials — organising, supervising or simply making conversation. Ila Gupta, the director and producer of this incredibly rich event, is among the event’s most crucial pillars. Invisible though she tries to be, she manages to grab our attention — gently, subtly — with her professionalism, kindness and boundless energy. Indeed, nothing would work if she didn’t visit regularly, let alone being present during the festival events themselves. Gupta is so immersed and dedicated, you cannot discuss anything at all with her without it turning into a conversation about the festival. 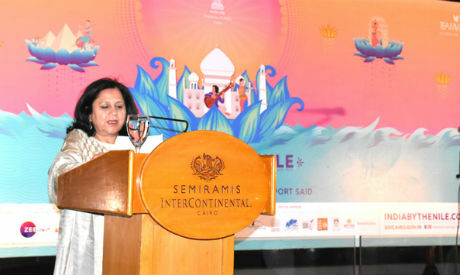 It seems apt therefore to introduce her through the prism of India by the Nile, one of the many creative endeavours of Teamwork Arts where she has worked for 25 years. In India many families pass creative skills from parent to child, but Gupta was never trained as an artist; she is neither a musician nor a dancer, she explains. Through public and private partnerships, they have thus been organising Indian festivals in Singapore, Hong Kong, Indonesia, Australia, the USA, the UK, South Africa and Zimbabwe, with Egypt becoming “one of our key festivals along the way. Most recently we launched a festival in Turkey as well and we are eyeing Kenya.” Gupta is not responsible for all the festivals since Teamwork Arts has broken up its geographical reach. By the time I meet Gupta in mid-March, she has concluded her two-week stay here and is headed to Turkey to oversee the festival there, before returning home. Over the years India by the Nile has evolved considerably. The first three editions of the festival included a large-scale stage production, a Bollywood show presenting an artistic extravaganza of dance, singing and a lot of fun, all of which attracted a large audience while demonstration the Egyptian public’s unconditional interest in Bollywood. Together with the show came the India-based French choreographer Gilles Chuyen, who gives a Bollywood dance workshop, one of the festival’s most popular elements which continues through the years. 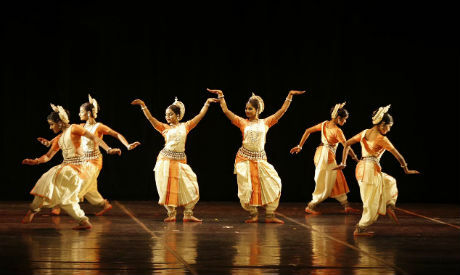 With their uniqueness and iridescent beauty, India’s classical and contemporary dance and music forms are undeniably among India by the Nile’s highlights. 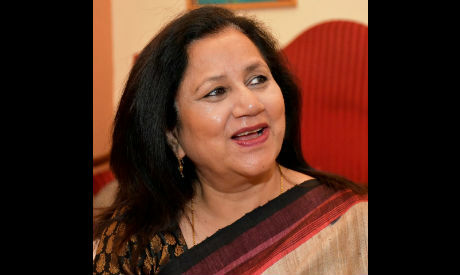 “Music is the biggest communicator, because it goes beyond language and geographies; it speaks to us beyond the lyrics.” Gupta’s eyes brighten as she talks about the living movement, colours, costumes, and many messages that touch the soul even if the audience does not decipher the classical vocabulary. “India has such a rich tradition of arts, as does Egypt. We think that India and Egypt are really close, kind of similar in their cultural share. Maybe both countries differ in their artistic formats, yet at the end of the day, we all talk about the same thing: fun, joy, love, peace,” Gupta says giving an example of Tanoura dancers and the heart she takes from the whole atmosphere that comes with it. Indeed, through her work, Gupta is able to have closer insights into each culture, she sees much more than any tourist can. Her job has also developed in her an ability to deal with different people, cultures and a variety of cultural institutions, bodies supporting the festivals in each country, people working within those bodies as well as the artists. “Music, dance and many other creative forms have no boundaries. They carry a universal language regardless of the nationality, culture or religion of the performers or the audience. In India, traditionally many centuries ago, music and dance were offerings to the gods; take temple dances as an example. 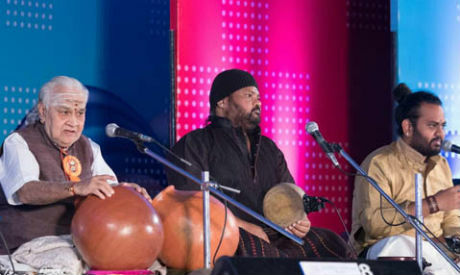 We also have a tradition of Qawwali [devotional music and songs] performed in the dargahs [India’s Muslim mausoleums or shrines].” Gupta explains that since in today’s India arts are becoming a “public affair”, that is open to everyone.